Vegetables are good for you, but what will you do if you don’t have teeth to chew them? Blend it, juice it, stew it, maybe make a soup? In the same way, yoga is good for you, for everyone, but it must be made digestible to the individuals in your class. I have been teaching yoga for more than 20 years now. 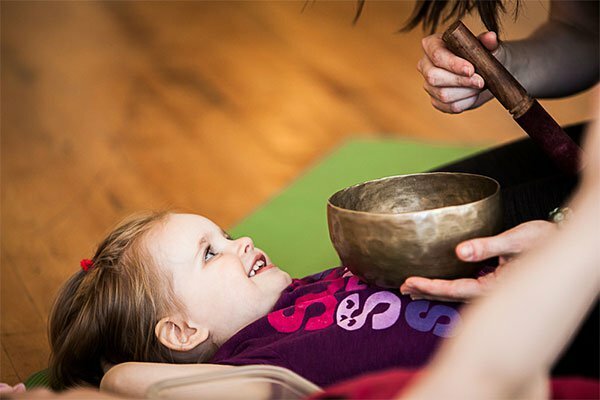 For the first 10 years, I thought that yoga will simply not work for children younger than 3. After a lot of experiments and amusing “failures,” I have discovered a few simple secrets to make those classes engaging and fun. Put the following points into practice with your little yogis and be amazed at their success! This is the most essential point to remember! At this age, they have just started to walk, and are slowly learning how to talk. They find it challenging to connect between the name of an Animal, how it looks like, what sounds it makes, what it does, where it lives, etc. So using imagination or just saying the names of the yoga animals will not give them the support they need to keep their attention engaged throughout the class. Poses with a Plush Toy – Collect dolls of animals you wish to do their poses during class and let the kids pick up one animal at a time for all to do yoga with. I have the children randomly pick the yoga animals from a Magic Sack I made; it makes it easy to plan and do the exact poses I wish to teach. Hand Puppets – Kids are always more interested in puppets than teachers, so they’re an easy way to keep the children’s attention. Pull out the puppets one at a time and let it teach the children how to do the pose and even tell interesting facts about itself. Animal Masks – As you wear them, you become that yoga animal and lead your flock or herd through poses that are connected to that animal and its environment. Stamps of Animals/Objects – As each kid gets stamped, we all do the pose together. Not more then 3 stamps per kid though! Parents don’t like getting their kids covered with ink. Picture Book – As you turn the pages and each animal or object is being discovered, you all do the poses together. Raise the book up and make sure that everyone can see the pictures! Yoga Story Time with a Book – Choose an age-appropriate storybook with lots of animals or objects in it and make it into a whole yoga class. As you read the story, do the animals and objects in the book all together with your bodies. It’s a great idea for classes in libraries, choosing a different book every week! Poses with Stickers – You can do the poses that are on the stickers you give the kids, or poses of animals that are in the same colors as the stickers. You can then proceed to use the stickers as a toll to guide the kids to move different body parts into the poses. For example, ask the kids to put stickers on their knees while in butterfly pose, then ask them to bring the stickers up and down to move their knees. If you put stickers on your feet, ask the children to reach to the stickers to touch their feet, or to bring one sticker up in the air to lift a leg up in a pose. Yoga Cards – They’re visual and you can hide them under the kids’ yoga mats for them to discover one at a time to do the poses.You can also play matching card games, or do a yoga freeze dance where they need to turn over a card and do that pose when the music pauses. When you’re young, talk is not always easy to understand AND it also becomes boring. Songs are different though; they are fun and engaging, and an awesome tool to help kids stay longer in a pose. So if you can, sing instead of talking! Try to find a song for every single pose. You can invent your own on the spot if you need to. Make a lot of sound effects. Most animals and objects make a sound; use it to keep the kids engaged! Do fewer poses but repeat them A LOT! Kids of this age group learn through repetition. You know how little kids like the same story read to them every night, or watch the same movie a million times? That’s how they learn at this age. You can ask them toward the end of the class “which animals did we meet today?” And as they say what they remember, proceed to do all of those poses again with them! It is also a good idea to always start the class in the same way; it will condition their bodies and their minds to be ready for the yoga class. Work with the energy of the kids and flow with their needs and wishes or they will simply cry (which is OK too). Be patient, they learn even if they just watch. Be flexible with what you have planned, and flow with what happens instead of fighting.Let the class be fun and silly! This is more like a “yoga playgroup” than a yoga class. Don’t over stretch the class; when it’s done it’s done, if you see that they had enough, move toward a short relaxation. 45 Minutes is usually a good time frame for this age group, but don’t look at the clock; look at the kids. Children of this age can’t balance on one leg by themselves—but they can definitely do it holding a hand with a friend, parent,the teacher, or even with the help of the wall. Even though it’s a kids-only class, organizing it with parental participation will help the kids do even more and for longer! They learn though imitation, not explanation. Demonstrate and do everything with them and avoid complicated instructions like “scoop your tailbone in” and similar grownup yoga lingo. To do the Cat/Cow, for example, I say “look at your bellybutton” while demonstrating the Cat Pose and “look up” for the Cow Pose. Be creative! Use lots of props. 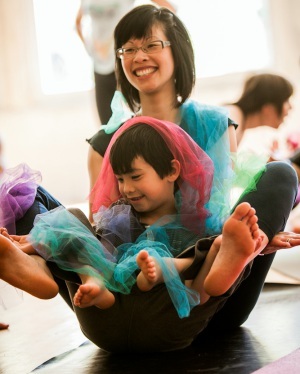 It will help the kids stay longer in the poses, explore movement and breathing, interact more with each other, and even relax longer.Hula Hoops, balls, parachutes, bells, pin wheels, bubbles... it can all be used to do more yoga! Quiet time and relaxation are an important element of yoga and are a part of every class. But again, you must fit the practice to the age group of the kids. Their imagination is still underdeveloped; so use very little guided imagery, and more foot massage, tactile props like soft feathers or bubbles bursting on their skin, relaxing sounds like a Tibetan Medicine Bowl ringing over their belly, or a short story. Take the time to research and learn about this age group’s abilities and motor skills. It will help you avoid poses that are bound to be too challenging, and focus more on the skills that these children can easily gain. For example, kids of this age don’t have perception of behind, so you will find that they can’t roll forward and back but only from side to side. Poses like plow, shoulder stand and camel, where they need to bring their body backward, will not be possible for them. Start with simple poses and games. Being successful and being praised for it will help these children to build a strong foundation for their yoga practice and will make them LOVE IT!